If you want Alicia Keys' piano sound, you'll want this. It sounds authentic. 'Only' 7GB. Plenty of control. It's a produced rather than natural sound. You'll love or hate the pink interface. NI's latest keyboard instrument is their most high-proile endorsement to date. Developed in collaboration with Alicia and her engineer Ann Mincieli (and with Thomas Skarbye programming) the result is an instrument based on her own Yamaha C3 Neo, and one she's using in the studio and live. So, what's the score? You've got just one main piano instrument here, but it's accompanied by six tabbed pages with features ranging from algorithmic and convolution reverbs to attack/release behaviour and sympathetic resonance settings. Both sustain and sostenuto pedals are catered for, and if you have a continuous sustain pedal, there's a simulated half-pedalling option. One of the nicest features is simple fader control for mechanical noise, including pedal, key and even microphone hiss. The pink interface may not appeal to everyone, and the sound lacks some of the natural room character associated with classical piano instruments; however, that clearly wasn't the remit. 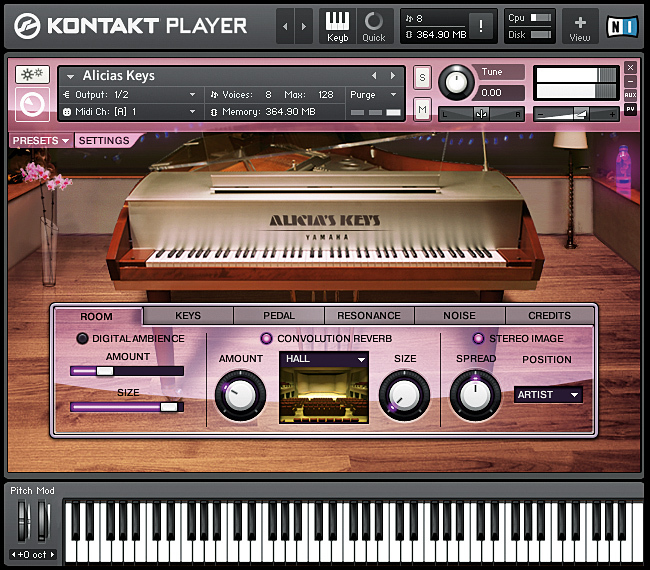 Alicia's Keys delivers an excellently 'produced' piano sound, with plenty of tone and behaviour-shaping flexibility, all from a fairly compact 7GB drive footprint.